The Garmin Forerunner 620 is Garmin’s top global positioning running watch. This wrist-worn device utilizes an internal accelerometer along with an all new heart rate per minute run strap to offer users not just GPS tracking but also a wide range of clever running metrics to help them better understand their personal running capabilities and style. 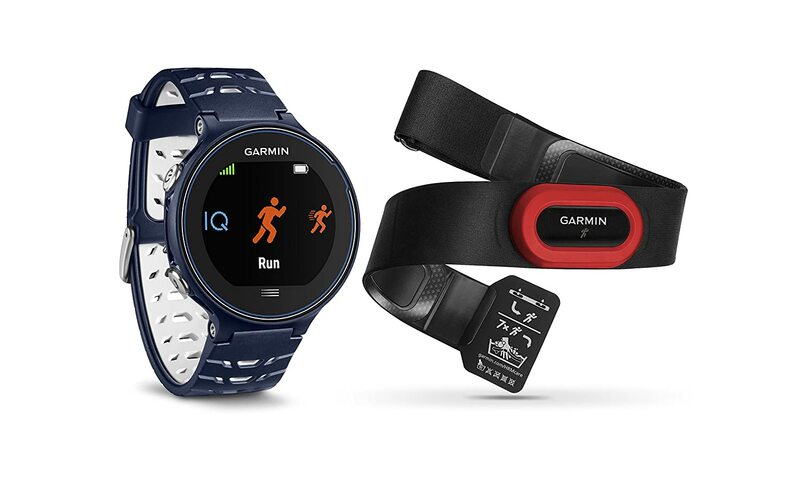 Adding to the already established ANT+ wireless technology, the Garmin Forerunner 620 becomes the first running watch that Garmin has produced that integrates both Bluetooth Smart and WiFi to enable the user to communicate with both their home WiFi network and their smartphone for seamless wireless data transfer. The Forerunner 620 also includes the live track feature that people may have already seen in the Garmin Edge 810. As an additional bonus, this running watch is fully waterproof up to 50 meters. It is available in blue/black and white/orange color combinations and priced from approximately $300 for the watch only model to only $381.28 on Amazon, which includes the heart rate monitor, taxes, and free shipping (as of 6/3/15). The screen on the watch is visibly larger but does not feel oversized. It is also extremely easy to read. The backlighting is perfectly even. Users are able to easily read the data especially during night time. People also like the vibrating motor that makes interval running much easier. This is especially true if they like to listen to music as they run. The touch screen feature also works very well even when people are wearing gloves. People like the fact that the watch is able to sync with their phone or computer without the need to use plugs. Syncing is also made easy because of WiFi support. Aside from that, users also like the fact that the strap feels more secure and is a lot more comfortable on their wrist with venting that is nicely designed. People also like that the watch is very lightweight to wear. Some users even claimed that they feel like they are wearing a watch at all. The buttons on the watch are very easy to find, and they have a satisfying click to them. The watch is also very accurate. One owner of this watch reported that the GPS system on the Garmin Forerunner 620 matched the actual path that they followed almost perfectly. Another strong point of this watch is that it has the capability to become a USB storage device, and the data can be directly accessed should a person wish. The watch can be paired with the iPhone 4S and Android devices to upload and transfer data. People also like the resistive screen on this watch. This is different than the capacitive screen that some watches have. The main advantage of this is that people can see the screen on rainy days. Alerts are another area where this watch shines. The pace alerts help people to stay on target during a race while the heart rate alerts help them pace out a long and slow race. These alerts are very helpful and easy to set up. Saving a run on this watch no longer requires pushing down the split button for three seconds. Now, people can simply tap save on the screen. Aside from that, the charge cradle sits on the cradle very easily. There is no need for people to right swipe to unlock. Instead, a simple button press followed by a screen tap gets the job done. Satellite connectivity is one area where some people feel that the Garmin Forerunner 620 fails. Some days it connects in seconds while on other days it takes 30 minutes. A user reported that on one occasion it did not connect at all. Aside from that, some users claim that syncing the watch through the use of their computer was sometimes problematic. The desktop software can be a bit buggy, and it ultimately failed to sync a number of times. Additionally, some users wish that it had a mapping feature. This would be a great feature for trying out new running routes that they pick ahead of time. Some owners complain that the watch suffers from software bugs. One example of this is the watch having to reboot after each run where GPS has been utilized. In one instance, the watch rebooted during the middle of a run. There is also no built-in metronome. Even though it is a simple feature, it could have increased the utility significantly. People also do not like the shiny plastic on the sides that makes it look too thick. Users also do not like the fact that GPS defaults are set to on. They wish that the watch had a setting that allows changing the default. Even though it has some drawbacks, the Forerunner 620 is aesthetically designed with a fantastic feel and look along with a number of great features. It is much easier to use and set up than its predecessor. The advanced features also make it stand out from the competition. It has the capability to squeeze improvement out of users and guide them through their training by giving feedback and making sure that they do not train too hard. On race day, it will help owners pace themselves and hit their target time. Basically, it is a great personal trainer that people should have on their wrist at all times.